Well that was something wasn’t it? The results are in from yesterday’s General Election and it’s safe to say Mrs May had a bad day when things did not go quite her way. Her intention with calling the election, you know the one she initially said she’d never ever call, was to get a greater majority in Parliament. To have a majority in Parliament you need to have 326 seats (there are 650 in total) and she went in to the election with 330 seats. Now she has 318… Yeah. She somehow managed to lose that majority from an election that, when it was annonuced, should have been a cake walk for her. Jeremy Corbyn’s Labour did well and gained 29 seats and did something that many thought was impossible. He managed to attract the youth vote. It’s truly unheard of any politician doing that so hats off to the guy. He led his campaign with a grace and style that the Tories simply lacked. He never went in for name calling, he actually debated his rivals unlike Theresa May who ran and hid, and he has hopefully proven to his party that he’s taking them in the right direction. He’s done better than we dared dream. Theresa May, however, is still hanging on. She’s done a deal with the Democratic Unionist Party (DUP), who are a Northern Ireland based pro Monarchy pro UK party (as opposed to Sinn Fein who want Ireland to be reunited), to get her just about over that magic 326 and is off to see the Queen later today for permission to form a Government. Quite why she hasn’t quit is beyond me. As we read when I revealed which side I backed she has a god awful track record. Truly shocking. And this is yet another epic fail in her career. How can her own party trust her when she can lose as many seats as she did? The arrogance in calling the snap election backfired on her spectacularly. If you look at the world’s press, rather than the UK press, it’s clear that other world leaders and former world leaders are all saying she should resign. Will she listen? I somehow doubt it. She’s still calling for stability in the uncertain weeks ahead and she still thinks she is the right person for the job. The thing is? I truly believe she believes that. She’s that deluded. She’s made things more uncertain, not less, so her position is now a huge liability and as I said. She needs to have the grace to stand down. One prediction I made at the start of this election was wrong. I predicted that this would be the lowest turn out of any election. In fact it was the highest voter turnout since 1997 and the engaged youth vote was a large part of that. There are some very uncertain times ahead, and I’d wager we’ll see another general election before the years out, but today’s results have shown us something. They’ve shown us the start of a youth pro-Labour movement. They’ve shown us a Labour resurgence. They’ve shown us that arrogance can spectacularly backfire on you if your name is “Theresa May.” They’ve shown us UKIP are pretty much dead in the water. They’ve not a single MP and had only around 2% of the overall vote. 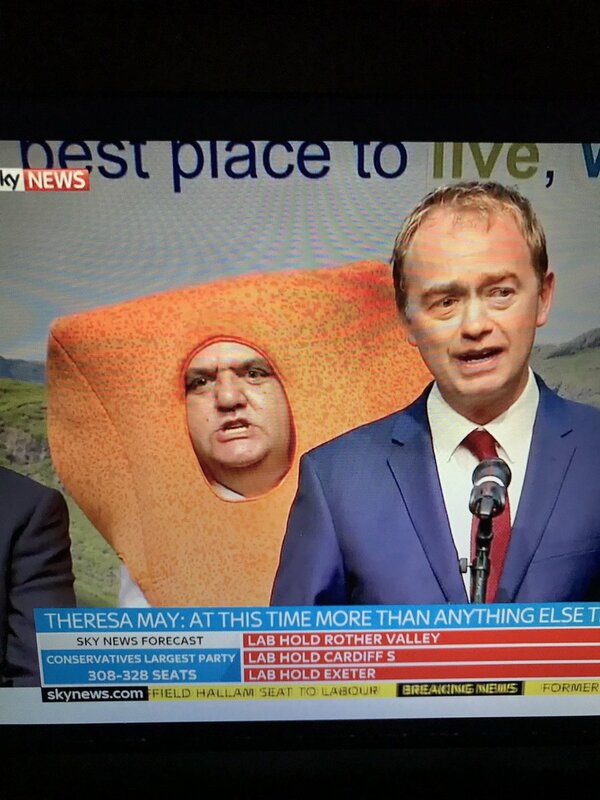 And they’ve shown us Lib Dem leader Tim Farron stood next to a man dressed as a fish finger and Theresa May stood with Elmo from Sesame Street (who got 3 votes) and a man called Lord Buckethead who got an all together more impressive vote tally of 249. Tim Farron managed to defeat Mr Fishfinger in the 2017 Election to keep his seat. 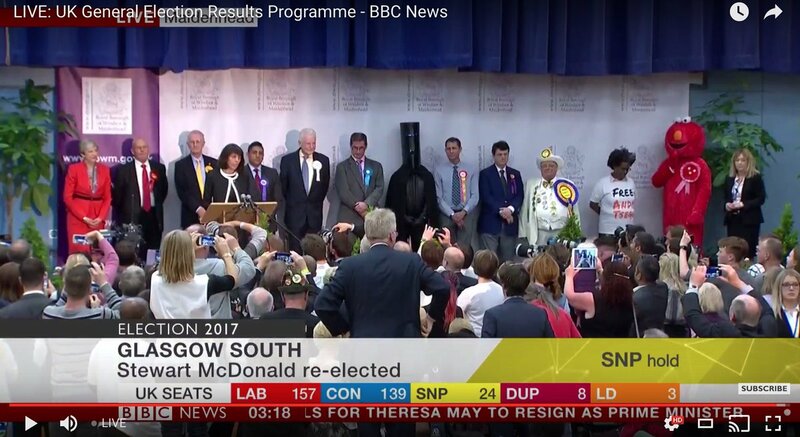 Alas Lord Buckethead and Elmo (you can just see his arm) both lost out to Theresa May at the election last night. And to any American’s reading this you did NOT read that wrong. This is the British for you. We are awesome! 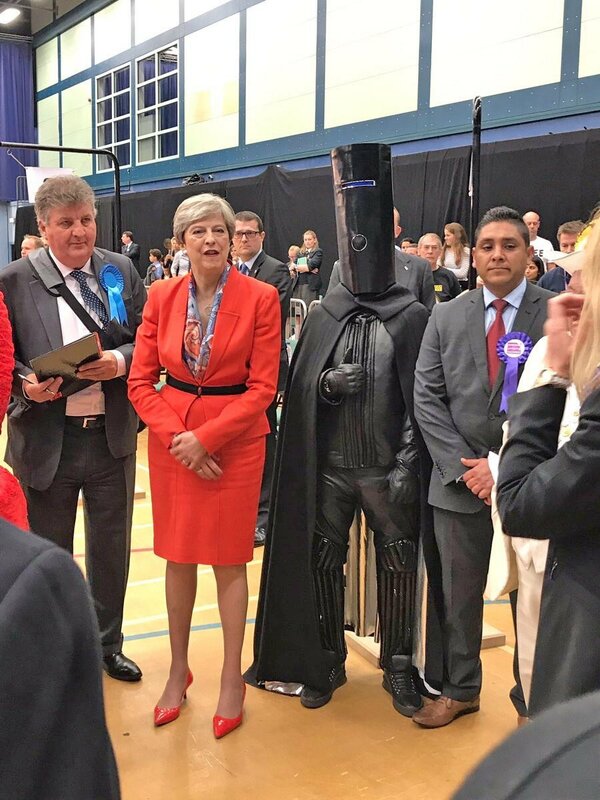 Theresa May facing stiff competition from Elmo, Lord Buckethead, and an odd cowboy type bloke. This is British Politics at it’s finest. Let’s just hope that humility and calm heads prevail and that this ongoing farce of Brexit can finally get decided once and for all.